«Tolmach» is an integrated translating environment, service that combines all necessary tools for the translator in one place — glossaries, translation memory databases, dictionaries, machine translation engines and more. All the paperwork also will be done by «Tolmach». All you have to do is to load the document into the system. 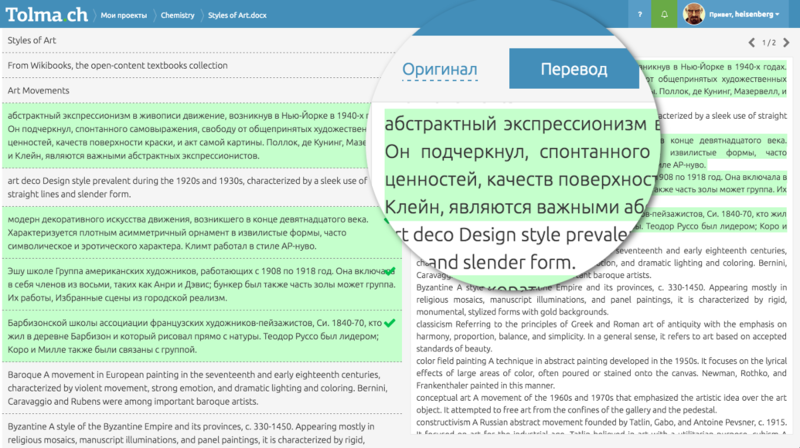 All the extraction of useful text and division up into easy to translate fragments will be produced automatically. Invite old colleagues or find new ones to work on Your project not looking up from translation. All the paperwork is up to us. «Tolmach» will parse received documents, extract all the useful textual data and split it into easy to translate fragments. Translate the text using glossaries, translation memory databases, machine translation systems and prepared dictionaries. This is a user's personal page. You do not need to fill out tedious questionnaires during registration - we can get your stuff from your social network profile. Here you can see all the statistics that present your experience as translator: total number of translated fragments and graphs showing which language pairs do you prefer to work with. 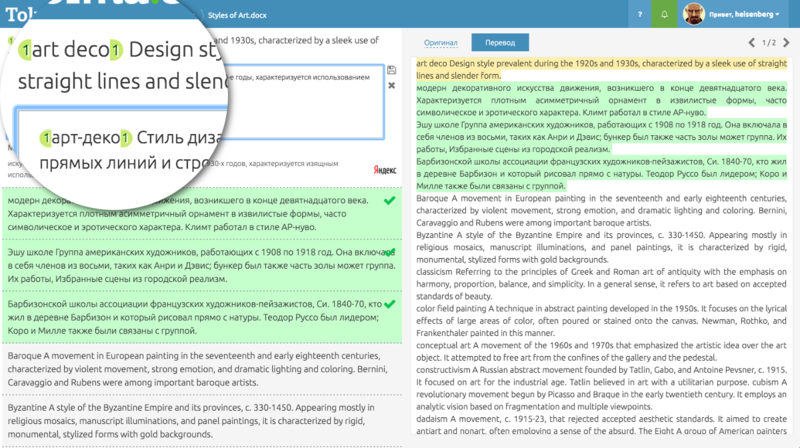 Now several interpreters can comfortably work with one document simultaneously — share the responsibility for exact pieces of text between different translators, offer different translations of the same fragments, choosing, in the end, the best offered fragments. 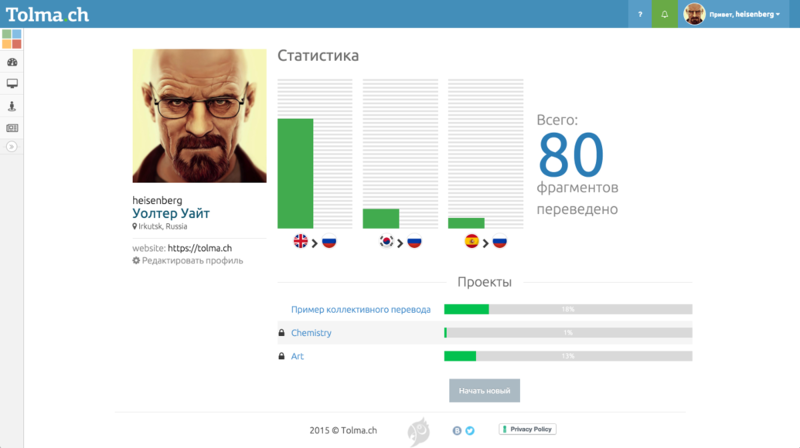 Team editor now can watch the whole process live — he will not have to spend huge amount of time to wait for the results of translation, and translators will be able to get feedback almost immediately after translation publication. No need to upload the same document several times - it is possible to translate the same one into several languages at once. Translation memory databases help you to translate similar documents faster, reusing previously made translations. 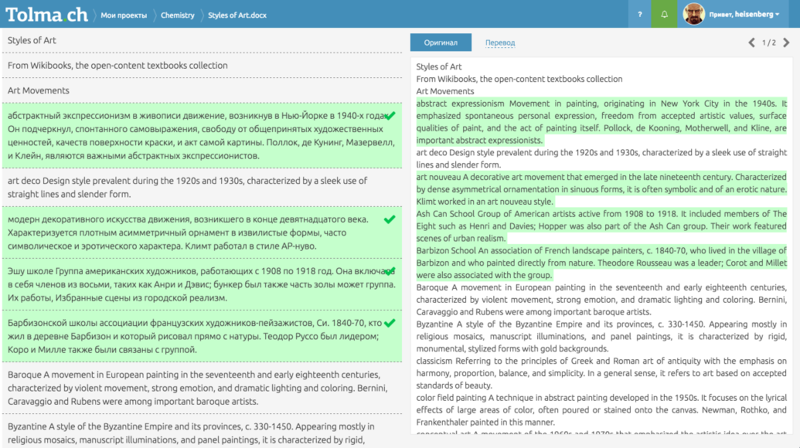 Correctly formatted glossaries will help to maintain a consistent style of translation, regardless of whether you work alone or in a group. We put a lot of effort to make the «Tolmach» interface as easy and minimalistic as possible. And despite the fact that we have already achieved significant results, we are constantly looking for new opportunities to make «Tolmach» even more simple and convenient. 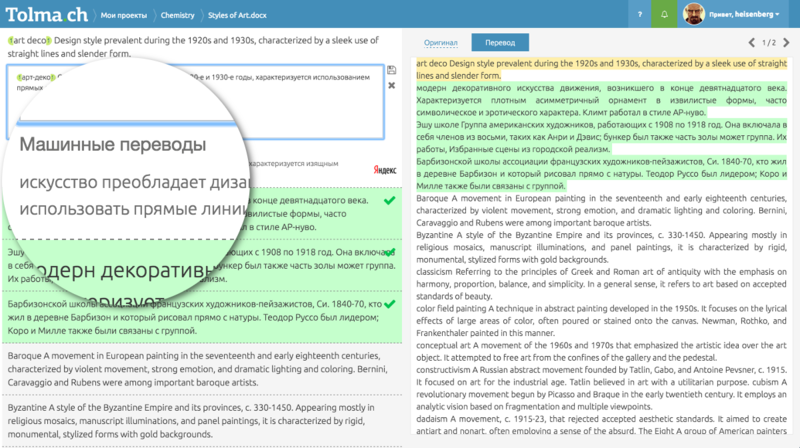 Evaluate the integrity and consistency of the translated text without being distracted from the process of translation, literally by a single click. Documents with complex formatting is not a problem for the «Tolmach». You don't need to think about how the text was formatted in the original document. Was it bold, italic, or underlined. All this does not matter in the translating process and should not distract you from what is most important. 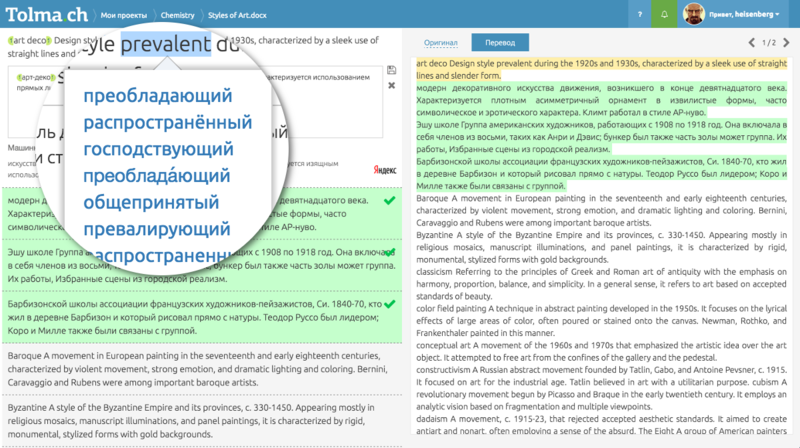 And in order to save the formatting of the translated document similar to the original, «Tolmach» will tell you where to make the necessary notes. Despite the fact that machine translations result texts' quality is far from perfect, they can be a good help during the initial stages of translation. They help to make an initial, very rough translation on the basis of which the final, much more high-quality translation is built. When you see an unfamiliar word, you don't need to interrupt the translating process to use an external dictionary. You can just select the word and translate it in one click using the «Tolmach» inner dictionary. Dictionary database is not static and is being constantly updated. Just register or log in to the service using your Vkontakte, Facebook or Twitter account. 0 rubles you need to use the service.